 Two Kanas Lake creatures / Screenshot from CCTV news, most likely filmed in 2005. There are no doubts that some enormous animals live in Kanas Lake – possibly the largest freshwater fishes in the world. Nevertheless their existence has not been proved yet. By geological time scale Kanas Lake is not very old: it was created by glacier activity some 200,000 years ago. This spectacular lake is located in a deep valley and is surrounded by high mountains. Lake is some 25 km long and approximately 2.5 km wide. 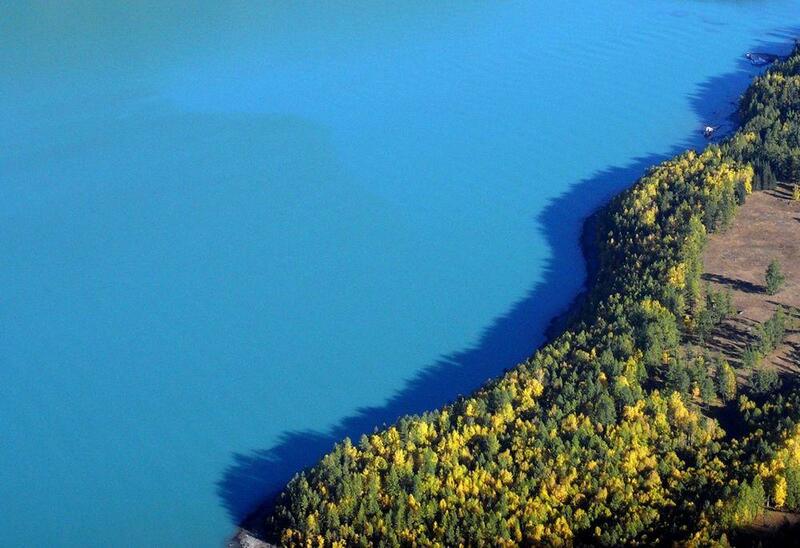 It is the deepest glacial lake in China, up to 188.5 m deep. It is fed by streams which come from the largest glaciers of Altai Mountains in the vicinities of Youyi Peak. Water from glaciers contains very small particles which are sinking very slowly. As a result such water is a bit "milky" and has unusual colors. 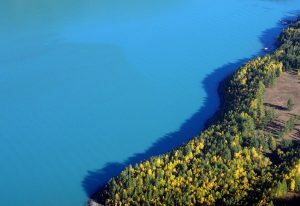 Color of Kanas Lake is changing from emerald green to deep blue, depending on the time of the day and weather conditions. Spines of several Kanas Lake creatures. Blurry and hard to see anything? Well, after all we are dealing with cryptozoology! / Screenshot from a movie made by tourists, Sina Video, 2011. Surroundings of lake are inhabited by Kazakhs and Tuvans who up to the recent times were living their traditional, semi-nomadic way of life. Since the late 1980s the situation is changing. 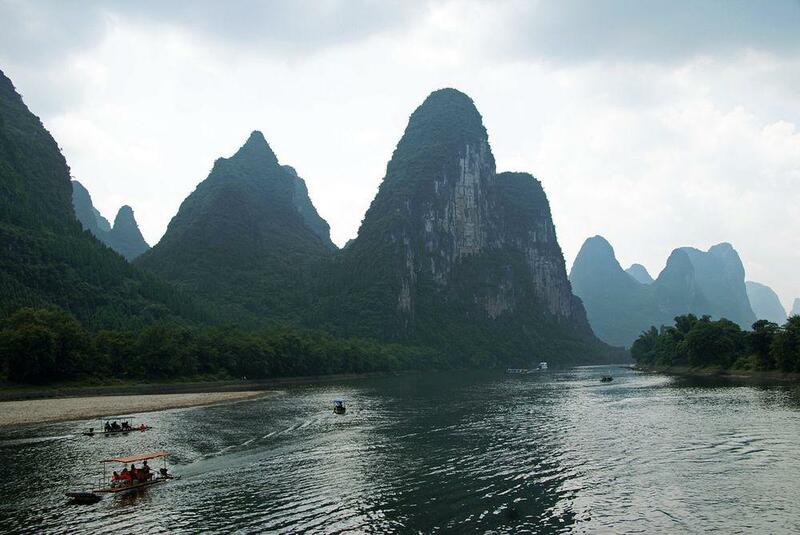 Chinese are becoming more affluent and during the vacation time they love to travel and learn their exciting country. Area around Lake Kanas is recognized as one of the most scenic places in China and is classified as AAAAA scenic area (e.g. top class scenery). Since the early 2000s it is developed – tourism facilities are relocated further away from the lake and hordes of tourists come to special visitor platforms and enjoy the view (if there are no clouds). Many take boat trips. As always, mass tourism comes with its own drawbacks. Many tourists are upset that instead of breathtaking and pristine Altai they see a kind of theme park with mockup Tuvan village and loads of cheap tourist paraphernalia.  Spectacular movie about Kanas Lake Monsters was made in 2012 / Screenshot from CCTV news. One of the main reasons why many tourists come here is the hope to see the legendary monsters of Kanas Lake. These creatures are known to local people for centuries. According to legends these monsters snatched sheep, cattle and even horses which were too close to the water. Such cases are reported up to this day. First known scientific research of these legends started in the 1980s by Yuan Guoying, Xinjiang University. Guoying did not believe too much in folk tales until he saw in the lake a group of some 50 reddish-brown fishes in 1985… each was some 10 – 15 m long! He and his students assessed that each of them could weigh more than 4 tons. The largest known freshwater fish today is Mekong giant catfish (Pangasianodon gigas) which is up to 3.2 m long – thus in Kanas Lake should be living something extraordinary! In 1987 there took place next study of the lake which came up with assumption that in Lake Kanas lives a population of 3 – 4 m long fish, possibly a subspecies of taimen (Hucho taimen). Taimen is a species of salmon which lives in rivers of Eastern Europe and Northern Asia. It is one of the largest freshwater fishes in the world: largest taimens are longer than 2 m and more than 100 kg heavy, oldest fish can be more than 55 years old. There are no doubts that taimen is giant fish – but does it grow 5 – 7 times longer than usual, up to the size of a small submarine? It is hard to imagine Chinese tourist walking around without his camera. Thus, since the early 2000s, when thousands of tourists started to visit in this area, lake almost continously is "under surveillance". This has brought interesting results: there is no other monster lake in the world with such a huge number of interesting footage. Unfortunately these movies are typical for cryptozoology: blurred, shaky, with something unclear – but at the same time exciting! Some even consider that this is clever public relations action by local tourism industry – and these events certainly have made the lake even more famous. July 6, 2005 – two animals are filmed by a tourist from yacht. Creatures are swimming together and are visible for some 2 minutes. They are longer than 10 m.
July 5, 2007, early morning ar 7:50 – 8:20 (is this some national holiday in China?). Group of 7 tourists observe and take video of two giant creatures. It looks as if these fishes are chasing each other, they jump out from the water rising huge waves. Each fish is at least 10 m long. 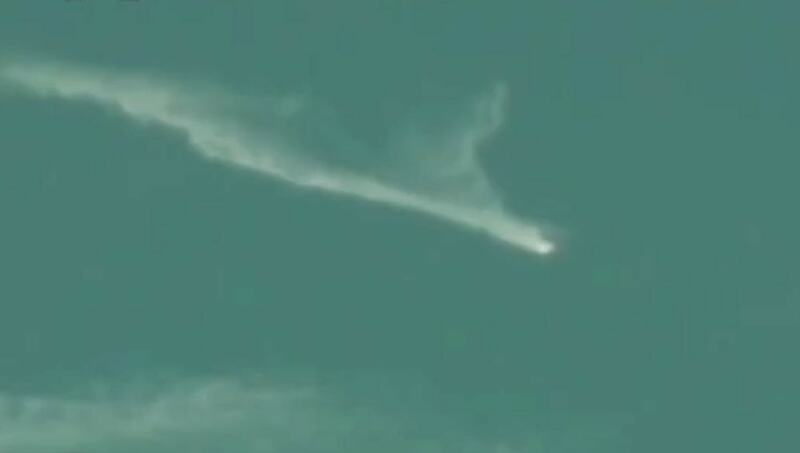 July 5, 2012 – 15 creatures observed and filmed. Footage is aired on different TV stations around China. September 9, 2013 – hundreds of tourists see distant shadow under the water which moves towards them. 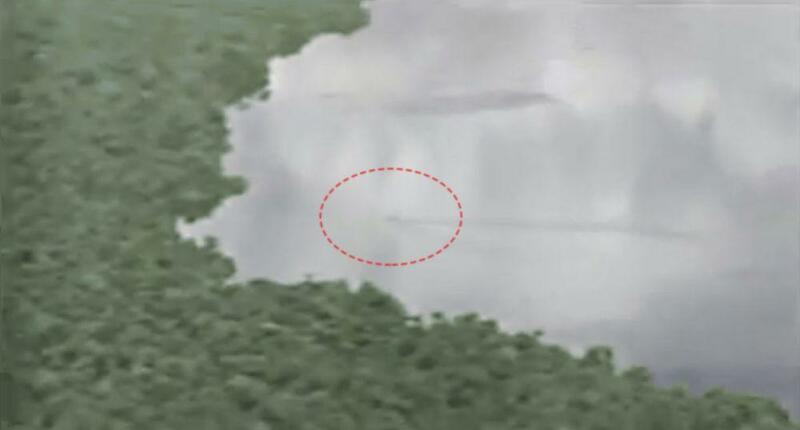 This creature is seen for some minutes and then it disappears deeper in the lake. Screenshot from one of the few good quality videos of Kanas Lake creature. 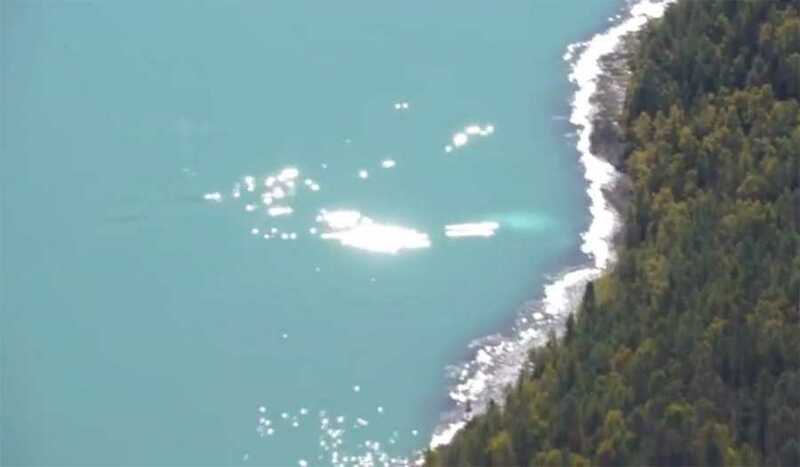 Nevertheless not much is seen – something large swims towards the author of video / Screenshot from tourist video, filmed on September 9, 2013. There have been made some efforts to study this phenomenon. In 2004 and 2005 there were organized expeditions to the lake but no results have been published. One of official explanations to the weird sightings is – tourists are observing big shools of salmon. Kanas Lake is unusual place with many other legends. Some local people tell that frequently here are seen weird lights during the nighttime. In cloudy, foggy days rather frequently can be observed another phenomenon – so called Buddha’s halo. In Europe it is called Brocken spectre. This is eerie experience: when looking to the clouds opposite the Sun, visitor sees a colourful circle of light with his shadow in the centre. This light phenomenon has scientific explanation but one can think that this is a divine sign of his enlightement. Xinjiang | A Traveler’s Guide to Far West China is the most comprehensive, up-to-date guide available on the Xinjiang region. Whether you’re a backpacker looking for information on hiking the Tianshan Mountains or a luxury traveler trying to discover a bed and breakfast in a comfortable grape orchard, this book covers everything you think you need to know…and more. The Loch Ness Monster, Bigfoot, the Abominable Snowman — these are the names of the elusive beasts that have caught the eye and captured the imaginations of people around the world for centuries. Recently, tales of these “monsters” have been corroborated by an increase in sightings, and out of these legends a new science has been born: cryptozoology — the study of hidden animals.